Rispa (Risperidone) is indicated for the treatment of acute and chronic schizophrenic psychoses, and other psychotic conditions, in which positive symptoms (such as hallucinations, delusions, thought disturbances, hostility, suspiciousness) and/or negative symptoms (such as blunted affect, emotional and social withdrawal, poverty of speech) are prominent. Rispa also alleviates affected symptoms (such as depression, guilt feelings, anxiety) associated with schizophrenia. Rispa is contraindicated in patients with a known hypersensitivity to the product. Rispa may be given once daily or twice daily. Patients should be titrated to 6 mg gradually over three days. Acute or chronic patients should start with 2 mg/day. The dosage should be increased to 4 mg on the second day and 6 mg on the third day. From then on the dosage can be maintained unchanged, or further individualized, if needed. The usual optimal dosage is 4 to 8 mg/day. However, some patients may benefit from lower doses. A slower titration phase may be medically appropriate. Doses above 10 mg/day have not been shown to be superior in efficacy to lower doses and may cause extra pyramidal symptoms. Since the safety of doses above 16 mg/day has not been evaluated, doses above this level should not be used. A benzodiazepine may be added to Rispa when additional sedation is required. A starting dose of 0.5 mg b.i.d. is recommended. This dosage can be individually adjusted with 0.5 mg b.i.d. increments to 1 to 2 mg b.i.d. Rispa is well tolerated by the elderly. Experience is lacking in children aged less than 15 years. A starting dose of 0.5 mg b.i.d. is recommended. This dosage can be individually adjusted with 0.5 mg b.i.d. increments to 1 to 2 mg b.i.d. Rispa should be used with caution in this group of patients until further experience is gained. Rispa is generally well tolerated. In many instances it has been difficult to differentiate adverse events from symptoms of the underlying disease. Adverse events observed in association with the use of Rispa are like insomnia, agitation, anxiety, headache, somnolence, fatigue, dizziness, impaired concentration, constipation, dyspepsia, nausea/vomiting, abdominal pain, blurred vision, priapism, erectile dysfunction, ejaculatory dysfunction, organic dysfunction, urinary incontinence, rhinitis, rash and other allergic reactions. Due to alpha-blocking activity of Rispa, hypotension can occur, especially during the initial dose-titration period. Rispa should be used with caution in patients with known cardiovascular disease (e.g. heart failure, myocardial infarction, conduction abnormalities, dehydration, hypovolaemia, or cerebrovascular disease) and the dosage should be gradually titrated as recommended. A dose reduction should be considered if hypotension occurs. Caution is also due when prescribing Rispa to patients with Parkinson\'s disease since, theoretically, it might cause a deterioration of the disease. Classical neuroleptics are known to lower the seizure threshold. Caution is recommended when treating patients with epilepsy. Patients may be advised to refrain from excessive eating in view of the possibility of weight gain. The safety of Rispa for use during human pregnancy has not been established. Although, in experimental animals, Rispa did not show direct reproductive toxicity, some indirect, prolactin and CNS-mediated effects were observed. No teratogenic effect of Rispa was noted in any study. Therefore, Rispa should only be used during pregnancy if the benefits outweigh the risks. The risk of using Rispa in combination with other drugs have not been systemically evaluated, given the primary CNS effects of Rispa it should be used with caution in combination with other centrally acting drugs. Rispa may antagonize the effect of levodopa and other dopamine-agonists. Carbamazepine has been shown to decrease the plasma levels of the active antipsychotic fraction of Rispa. Similar effects may be observed with other hepatic enzyme inducers. On discontinuation of carbamazepine or other hepatic enzyme inducers the dosage of Rispa should be re-evaluated. Phenothiazines, tricyclic antidepressants and some beta-blockers may increase the plasma concentrations of Rispa but not those of the antipsychotic fraction. Fluoxetine may increase the plasma concentration of Rispa but less so of the antipsychotic fraction. When Rispa is taken together with other highly protein-bound drugs, there is no clinically relevant displacement of either drugs from the plasma proteins. 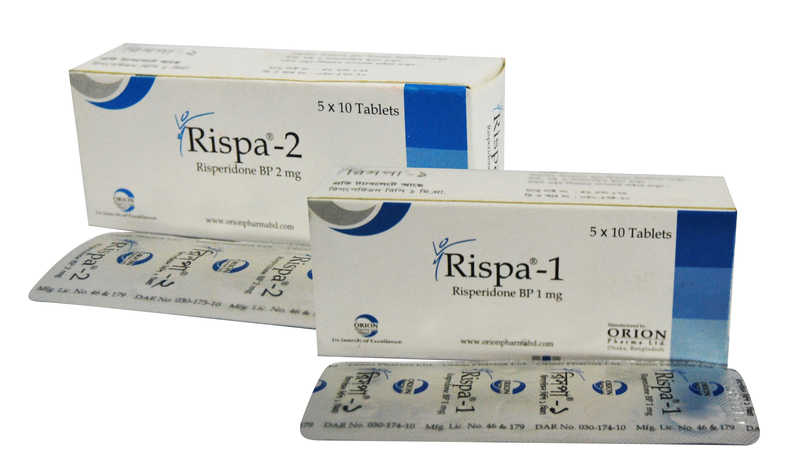 Rispa -1 Tablet: Box containing 5 x 10\'s tablets in blister pack. Rispa -2 Tablet: Box containing 5 x 10\'s tablets in blister pack.